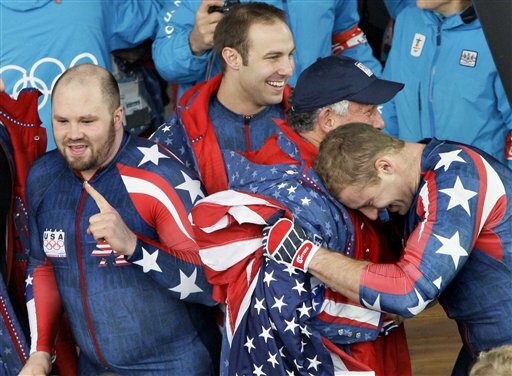 U.S. bobsled driver Nick Cunningham has seemed perfectly comfortable on the Olympic stage. He's perfectly comfortable on Garth Brooks' stage, too. Cunningham is an enormous Brooks fan, and was bummed for weeks when he missed out on a chance to see the megastar perform in July at the California Mid-State Fair. So in September, Cunningham was in Calgary for the U.S. bobsled push championships. His sledmate at the time was Ryan Bailey _ the brother of Robert Bailey, a backup singer for Brooks. Calls were placed. Plans were made. Cunningham thought he was getting tickets. He wound up getting a three-day experience. "See, you have to understand," Cunningham said. "Garth Brooks is the show that I've always wanted to see. I've been dying to see him my entire life." Robert Bailey arranged for Cunningham and Ryan Bailey to hang out a couple days before the show with the band and production crew. They were taken out to dinner _ Brooks and wife Trisha Yearwood weren't there, but arranged for a massive spread highlighted by enormous steaks _ and then told to return to the band's hotel a couple days later at 2 p.m.
Cunningham thought that was odd, since the show wasn't until night. Turns out, they rode with the band to the Scotiabank Saddledome, were there for the sound check, got to see Brooks adjust things for that night's performance on the fly, and eventually found themselves talking football before the show with Brooks. "I'm shaking," Cunningham said. "I'm pure fanboy at this moment. The greatest moment of my entire life is happening." During the show, Cunningham was whisked backstage for a moment and given a confetti cannon. Minutes later, he and Ryan Bailey were on stage, during "Friends In Low Places," firing confetti at those around the stage. Cunningham has a photo on his phone of he and Brooks, shouting toward each other, as the song is winding down. "That is the happiest moment of my entire life. That's me and Garth, on stage, just yelling in each other's faces. So now, I would like to say that I'm a Professional Confetti Cannon Operator." By the way, celebs just seem to be drawn to Cunningham. After hanging out with Brooks in September, it sounds like Cunningham may be taking Dale Earnhardt Jr. for a bobsled ride in the not-too-distant future. Earnhardt, the retired NASCAR star, is in Pyeongchang with NBC and he and Cunningham have connected on social media about sliding.